Weighing in at 2.23kg (nearly 5lb), the solid gold St. Edward’s crown (1661) is the heaviest crown in the collection. One of the smallest and lightest is Queen Victoria’s Small Diamond Crown (1870), which she wore with her widow’s veil, is tiny at only 9.4cm (3.7 in) high. By far the largest object in the Jewel House is the extravagantly decorated silver-gilt Grand Punch Bowl (1830). Over a metre wide, and weighing around 248kg (546lb), it was originally intended as a wine-cooler to hold 144 bottles of wine. There is so much gold thread in the Coronation Robes that they weigh over 13 kgs (30lbs). 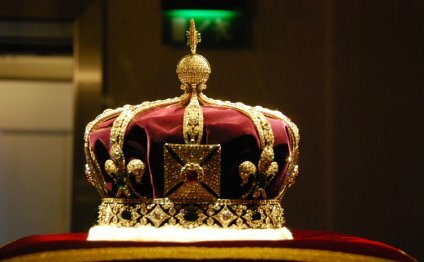 Crowns are made with the most expensive materials available at the time. The Crown of Queen Elizabeth the Queen Mother, made for her coronation in 1937, is the only crown in the collection made of platinum. The twelfth-century Coronation Spoon is the oldest object in the collection. It survived the destruction of the medieval and Tudor crown jewels in 1649, following the Civil War. The two largest diamonds in the Crown Jewels, Cullinan I (530.2 carats) and Cullinan II (317.4 carats) were both cut from one enormous diamond, unearthed in 1905. Today they adorn the Sovereign’s Sceptre with Cross and the Imperial State Crown. Mined in present day South Africa, the Cullinan was the largest rough diamond ever found - and initially thought to be a hoax. The Surface Manager at the Premier Mine had to persuade his colleagues to weigh the stone after one exclaimed ‘this is no diamond!’ and threw it out of the window. The rough diamond weighed an astonishing 3, 106 carats (621g). This gigantic diamond, named after Thomas Cullinan, the chairman of the Premier Mine, caused an international sensation. A decoy travelled to Europe on a heavily guarded ship, while the real diamond was sent by ordinary parcel post! Given by the Transvaal Government to Edward VII for his 66th birthday, the rough diamond was sent to Amsterdam to be cut. After eight months’ intensive work, Asscher’s produced 9 major diamonds (Cullinan I-IX), 96 small brilliants, and 9 carats of unpolished fragments. The most famous diamond in the Crown Jewels, the 105.6 carat Koh-i-Noor diamond is set today in the Crown of Queen Elizabeth the Queen Mother (1937). It is said to be unlucky for men to wear this diamond as it has a long and bloody history. This legendary diamond, originating in the Golconda mines in central southern India, has passed through the hands of conquering Mughal princes, Iranian warriors, Afghan rulers and Punjabi Maharajas before coming to Britain as the spoils of Empire. The Koh-i-Noor, (meaning ‘Mountain of Light’ in Persian), was surrendered in 1849 to Queen Victoria’s representatives following the Anglo-Sikh wars in the Punjab. Displayed in London at the Great Exhibition in 1851, the traditional rose-cut of the diamond failed to impress visitors expecting more sparkle. The following year the diamond was removed from its Indian setting, which is also on display in the Jewel House, and re-cut as an oval brilliant.
" TRAPPED IN THE SKY " is the first episode of the Supermarionation TV series Thunderbirds. It was first broadcast in UK on 30th September 1965, written and produced by Gerry Anderson and Sylvia Anderson and directed by Alan Pattillo.